The summer between 8th grade and freshman year, I participated in the sports camps at the high school I was about to attend. Soccer camp was from 1-4 pm followed by basketball from 6-9 pm. There wasn't enough time to trek home between the two camps, but a sophomore girl--Jessica--befriended me and invited me to her house between sports each day. We used the two hours to swap out basketball shoes for shinguards and "refuel" aka stuff our faces. Our meal of choice? Kraft macaroni and cheese with a generous amount of ketchup swirled in. I know what you're thinking. Ewwwww! Maybe mac and cheese with ketchup isn't your thing (although don't knock it until you try it! ), but what about tomato soup and grilled cheese? I consider this the more grown-up version of my fourteen year old self's favorite meal. 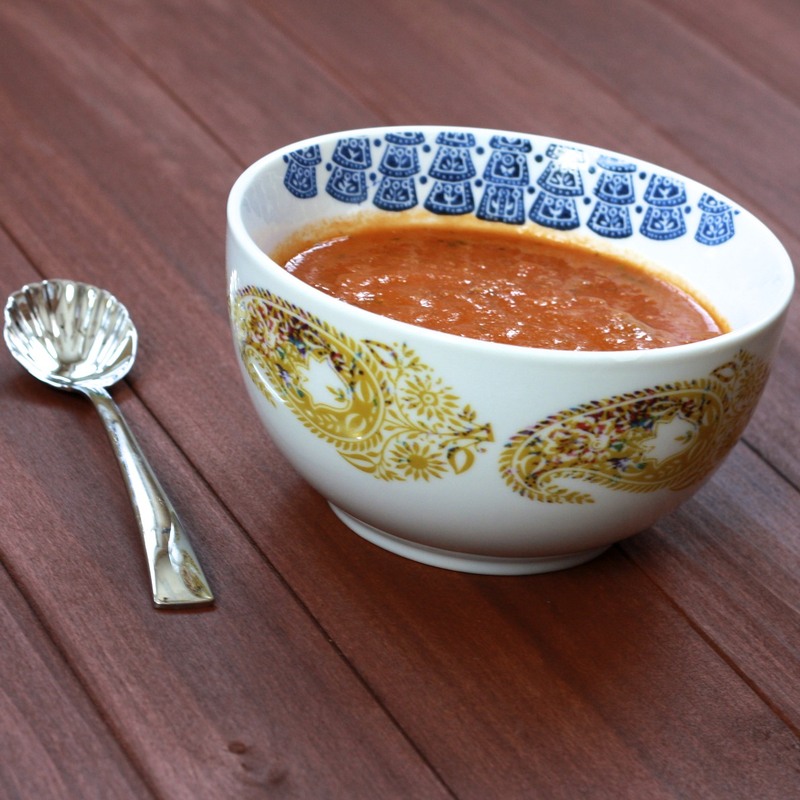 This tomato soup takes a little bit more effort than the Kraft blue box, but when you take your first bite, you'll be so glad you roasted your tomatoes! This soup is a little spicy (omit the red pepper flakes if you want a milder version) and bursting with the flavor of basil. Paired with grilled cheese, it's perfect comfort food! 1. Preheat oven to 400F. In a large bowl, toss together tomatoes, 1/4 cup olive oil, salt, and pepper. Spread tomatoes in one layer on a baking sheet lined with foil and roast for 45 minutes. 2. In a large stockpot over medium heat, saute onions and garlic with 2 tbsp olive oil, butter, and red pepper flakes. Saute for 10 minutes, until the onions start to brown. Add the canned tomatoes, basil, thyme, and chicken broth. 3. Add the oven-roasted tomatoes and their liquid and bring mixture to a boil. Simmer, uncovered, for 40 minutes. Blend to desired texture with an immersion blender.